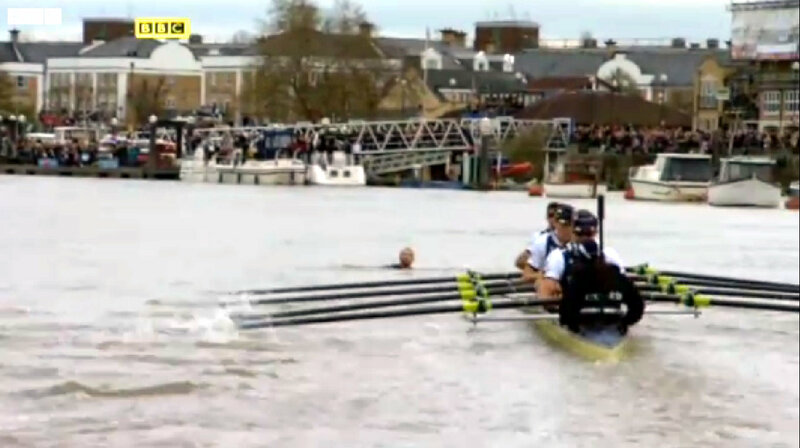 It is one of the prestigious events in the sporting calendar along with the Grand National, but Saturday's Boat Race between Oxford and Cambridge was ruined by a protester and other misfortunes which turned the event into a farce. The race began at 14:15 London time [13:15 GMT] with both Oxford and Cambridge running neck and neck as they passed the Harrods Depository. But soon after the two boats passed Hammersmith Bridge the race came to an unexpected halt after a swimmer was spotted in the Thames. Commentators expressed shock as footage showed the head of the swimmer narrowly miss being struck by Oxford's oars. Behind the flotilla of boats were halted and there was a long wait before the race was finally resumed. But the excitement had waned for many observers, with questions raised over whether the race should be called off altogether. When, after thirty minutes, the two boats set off again tragedy struck within seconds as oars clashed and Oxford lost an oar. The team struggled on, though this was no race, as Oxford trailed behind with only seven men rowing. But even after Cambridge had been cheered past the winning line and Oxford limped in behind, further bad luck struck after Oxford's bow Dr Alexander Woods collapsed from exhaustion and had to be treated by paramedics. After the race Oxford's cox protested the decision of the empire that they were at fault, but that appeal was rejected. There will no doubt be some speculation that the wake created by the police launch and coastguard vessel as well as the other boats had not subsided enough and might have contributed in Oxford being unable to steer away from the Cambridge team. The thirty minute delay will also have been a factor given the tide was coming in. And there will also be concerns over whether it was a fair win given the disruption to the race by the man who turned out to be protester Trenton Oldfield. The Australian activist with an anti-elitism manifesto brought the most bizarre and perhaps the most dangerous spectacle in the 158 years of the Boat Race, which had previously seen six sinkings and one restart. Oldfield was taken away by police after being dragged from the water and is likely to face public order charges. It could have been a lot worse for the activist. Sergeant Chris Tranter, of the Metropolitan Police, said the rowers had nearly decapitated the swimmer. "They almost took his head off," he said. Some people commenting on Twitter and bulletin boards wished he had been struck by the oars and expressed their anger over his disruption of the race. There was little celebration for Cambridge as the crew huddled together at the end of the race. With such a hollow victory, the winning ceremony was cancelled and the traditional throwing of the cox into the water was dispensed with. With Britain preparing for the London 2012 Olympics there will be concerns over security and if other protest groups or individuals are planning to disrupt events. There will be fears too at how an individual managed to so easily get so close to the boats and why he was not spotted sooner. While many Olympic events will be held behind walls of high security there are several events which are held on the streets of London or in other open spaces which could be vulnerable to either protests or even terrorist attack. No-one sustained any serious injury on Saturday, but it could panned out very differently. The media reaction to the incident was less critical than one might have expected, given the potential seriousness of the incident and possible repercussions. The Sunday Mirror suggested the swimming protester added excitement to an otherwise dull event. "Who said the Boat Race was boring?" the paper said. The Independent, normally a serious stable-mate on Fleet Street, also played down the protest describing the event as "the most incident packed" race in history.